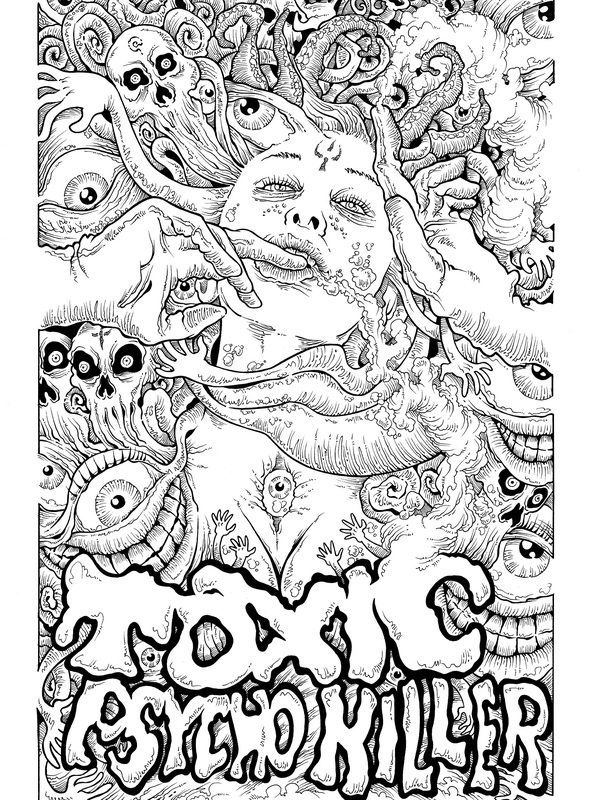 I wrote this foreword for the book Toxic Psycho Killer by Italian artist Paolo Massagli, published by Hollow Press. This is the complete text, with the cover, some pages from the book and a biography. There are cartoonists who continually look for new challenges. Individuals who wind up juggling a thousand different projects, flipping between comics and illustration to eke out a living. And then there are others who with focused determination and passion to a specific aesthetic ideal stride along a singular path, because they don’t need to please the audience or contend with the vagaries of the publishing industry. Paolo Massagli belongs to this latter category. And this is not to accuse him of rigidity but rather to state that the author of this comic has dedication. Whether he’s reinventing the fabulous world of Oz (in a series of which the fans are still waiting for the fourth issue), or bringing his audience to the hell of his Under Dark Weird Fantasy Grounds stories, or launching the reader into a space where no man has gone before, every page is unmistakably a page by Paolo Massagli. Some suggest Paolo’s brand is that of “Milo Manara drawing an American comic book from the ‘90s”. And while the comparison may be crude, the two Italian artists certainly have one thing in common: a devotion to the female form. 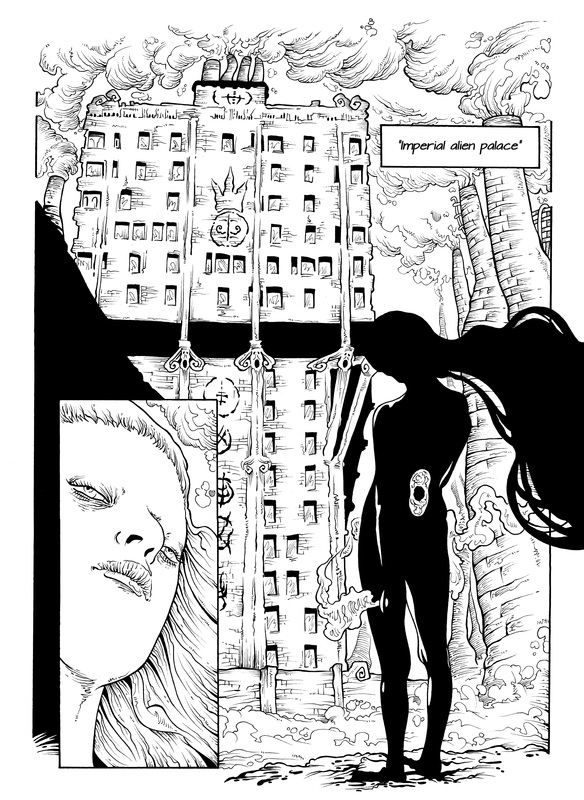 Indeed, when I found out Paolo was commissioned to draw a solo book for Hollow Press and that the title would be Toxic Psycho Killer, I was certain of one fact: there will be a lot of naked women. I also imagined a kind of American Psycho, a blend of dark moods and horrific situations with a crazy and mutant serial killer slaying women in the alleys of some undefined American metropolis. But when pressed about the subject matter, he explained it was about a “divine being landing on an undefined alien world to annihilate the whole population”. Well, at least I was right about the “undefined” setting. The action of Toxic Psycho Killer focuses on a single protagonist, a woman wandering in space to exterminate everything she considers a virus. At first she looks like a victim, then like a heroine, but actually she recalls Silver Surfer, the herald of Galactus traveling by way of surfboard through numerous galaxies to find a suitable world that will quell the Majestic Lord’s insatiable appetite. Anyway, the immediate difference with the Surfer is evident, not only because she does the dirty work on her own. In fact the rigid Comics Code Authority-governed qualities of the Surfer have little to do with the provocative and sensual protagonist of the comic you have in your hands. Paolo hovers around her, depicting her with precise, unsparing detail. For instance, in a gorgeous close-up he devotes himself to examining the contours of her mouth, wrinkle by wrinkle, as well as the appearance of her eyes, lash by lash. Maybe you’ll notice crisper, less intoxicated compositions than usual, where white space prevails over black and the line is clear, defined, tidy, as if we were in a French sci-fi serial from Métal Hurlant. But someone already familiar with Paolo’s comics shouldn’t be afraid. Even from within a deep space milieu, there are still spectacularly gruesome tentacles emerging from garishly-rendered mouths, myriad depictions of skulls and even a dark globe, helping to consign darkness to its own proper place. A place that is the center of Paolo Massagli’s art, where he crafts his own deviant visions. A place that is more than enough for him. Paolo Massagli is an Italian cartoonist and illustrator. He began his career as a draftsman in the early ’90s, making comics and illustrations for different magazines and fanzines. His bibliography counts a collection of fairytale horror stories called Le Minifiabe, the web-comic Alice nel Paese degli Orrori where he created a lysergic version of the famous novel by Lewis Carroll, and O.Z., a very personal reinterpretation of The Wizard of Oz released as self-published mini-comics from 2010. Now he is working on Hell, a story serialized in the Under Dark Weird Fantasy Grounds anthology published by Hollow Press. He has many fans in the USA, where his original artworks and commissions are mostly sold.